The first overt act of war on the Western front occurred at 1:30 o'clock on the morning of Sunday, August 2, 1914, when a detail of German officers in motor cars crossed the Moselle River at Wasserbilig and entered the Duchy of Luxembourg, whose neutrality Germany had guaranteed. They scoffed at the little Duchess of Luxembourg, who thought to block their passage by maneuvering her motor car across the roadway; sneered at the Luxembourg "army" of 300 gendarmes that lined the roadway; ignored the protests of the burgomaster and proceeded to the seizure of the Adolf bridge. Trêves and Luxembourg were occupied the same day. Presently, the movement of German cavalry across the bridge began, and before evening von Buelow's army of the Moselle had occupied the Duchy of Luxembourg. On the same day, clashes occurred between border patrols at Longwy and Luneville, French frontier towns. At 7 o'clock on the same Sunday evening, the German Minister to the court of Belgium, Herr von Below-Saleske, presented a "highly confidential" note to M. Davignon, the Belgian Minister for Foreign Affairs, falsely alleging that the German government had received reliable information of the intention of the French forces to invade Belgium through the valley of the Meuse, and declaring Germany's purpose to come to Belgium's aid and "forestall this attack of the enemy." If Belgium should consent to the German invasion and exhibit a friendly attitude, the German government would guarantee the kingdom and its possessions in their whole extent, and give indemnity for any damage resulting. If, on the contrary, Belgium should behave in a hostile manner toward the German troops, Germany would consider Belgium as an enemy. The Belgian Minister, on the following day, replied that the intentions attributed to France were in contradiction with the express declarations made to Belgium on August 1 by the French government ; that in event of a violation of Belgian neutrality by France, Belgium would offer the most vigorous opposition to the invader "without German assistance," and closing with the firm declaration that "the attempt against her independence with which the German government threatens her, would constitute a flagrant violation of international law," and that the Belgian government "has firmly resolved to repulse by every means in her power any attack upon her rights." Germany, thereupon, threw off the mask of hypocrisy and proceeded with her plans for the invasion of Belgium. The Imperial Chancellor, Dr. von Beth- mann-Hollweg, in a speech to the Reichstag on August 3, announcing the occupation of Luxemburg by German troops, publicly acknowledged that the invasion was "in contradiction to the rules of international law," but justifying the act on the plea of "necessity," and pledging the German government to "right the wrong as soon as our military ends have been reached." 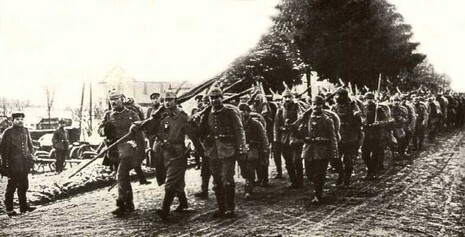 Luxembourg was invaded and occupied by Germany during the First World War, but was allowed to maintain its independence and political mechanisms. It was again invaded and subject to German occupation in the Second World War in 1940, and was formally annexed into the Third Reich in 1942.